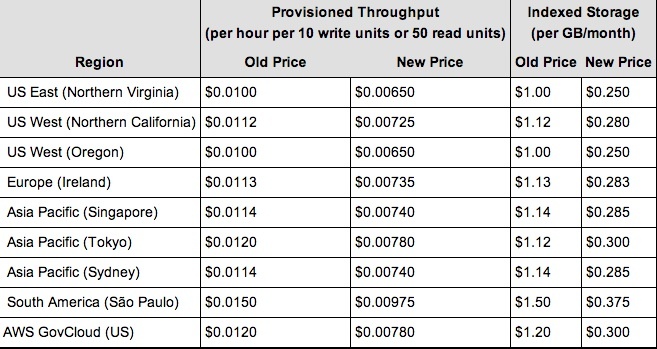 Amazon’s DynamoDB NoSQL database is just about a year old and Amazon’s cut prices on it to celebrate and is now offering reserved capacity if you qualify — you have to run all the instances in one region, for example — and can commit to one- or three-years of usage. In his blog, Amazon CTO Werner Vogels lauded how customers like Shazam have wielded the managed database service. As Vogels told GigaOM last year at the product launch, NoSQL suits social gaming and web applications but is also critical for the big data applications demanded by business. Since DynamoDB debuted, Amazon has launched a series of other big data and enterprise-focused services like the newly shipping Data Pipeline and promises more as it faces heightened competition from OpenStack players which include legacy IT giants IBM(s ibm), Red Hat(s rhat), Hewlett-Packard(s hpq) as well as Rackspace(s rax) and others. Rackspace just bought into the NoSQL database service with its acquisition of ObjectRocket and its MongoDB technology. 1. AWS users are not buying it as mongoDB is better suited for federated architecture. 2. To enable vendor lock-in afterall you app using it remains only with AWS. 3. Potential competition form other providers in IaaS & upcoming GCE.